What Are the Benefits of Cooking on Cast Iron Cookware? Cast iron pans have been used for more than 2,500 years. First made during the 4th century B.C., cast iron pans became popular in the United States during the 18th century. Before being used by the consumer, the pan is gray and must be seasoned with oil. 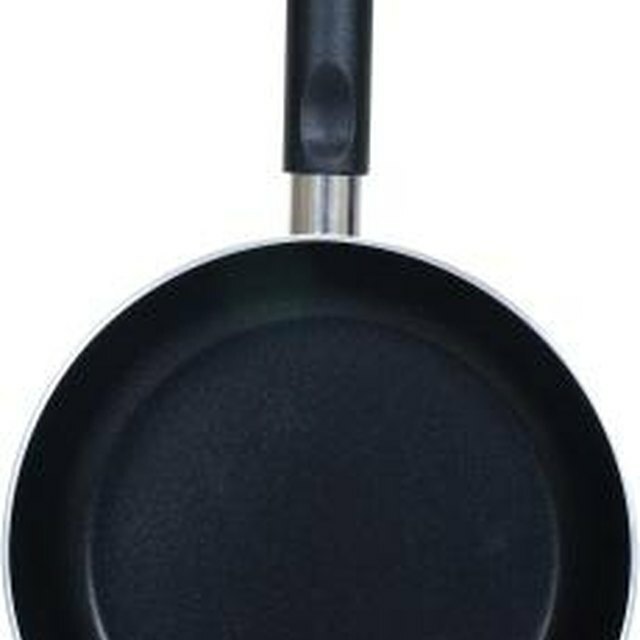 However, most of the cast iron pans on the market today are already factory-seasoned, and are black. With proper seasoning and maintenance, a cast iron pan can last for generations. Modern cast iron pans come in all sizes and shapes. The earliest known process for making cast iron pans was invented in China around 513 BC, according to Humboldt State University's website. The Chinese were the first to create the cookery because of their knowledge of melting iron. During ancient times, cast iron pans were made by first shaping sand casts and molds. Next, molten hot iron would be poured into the various shapes and left to cool. According to HSU, this ancient process is still in use today. Around 1100 AD, cast iron pans were first used in England. Originally created for use over an open flame, the cast iron pans were designed with three legs. With the advent of stove tops in the 1700s, cast iron pans lost the legs and began to be made in mass quantities. Cast iron pans are non-toxic, durable, reasonably inexpensive, feature even heat distribution, and has natural non-stick capabilities when seasoned properly and cared for. Additionally, the cast iron pan is versatile and can be used on the stove top to fry, sear and make pancakes, as well as in the oven to bake cakes and cornbread. As in ancient times, the pans can still be used over an open flame. To prevent the cast iron pan from rusting, it must be seasoned before use. However, even when factory-seasoned, the pan might need to be seasoned again. Acidic foods, such as tomato sauce, can remove the carbon layer. Iron cookery is also heavy. A 10-1/4 inch pan can weigh 5 lbs, and if dropped on a hard surface, the pan can break. Because it retains heat so well, it can cause burns if not given enough time to cool. Since the 1900s, other types of cookware have become popular, including stainless steel, aluminum, and later, pots and pans that were Teflon coated. However, because of concerns about toxicity in Teflon and other non-stick cookware, cast iron cookery remains a popular choice.